Most people aren’t aware of the fact that the siding on their house is meant to protect the felt underneath from the elements. The real water proofing of a home happens at the felt level, both on the roof, and on the exterior walls. There are three basic types of wood siding, each with their own set of rules, shake/shingle, board and batten and horizontal beveled siding. Each one requires its own unique installation process. Begin at the bottom and work your way up to install shingle/shake siding. 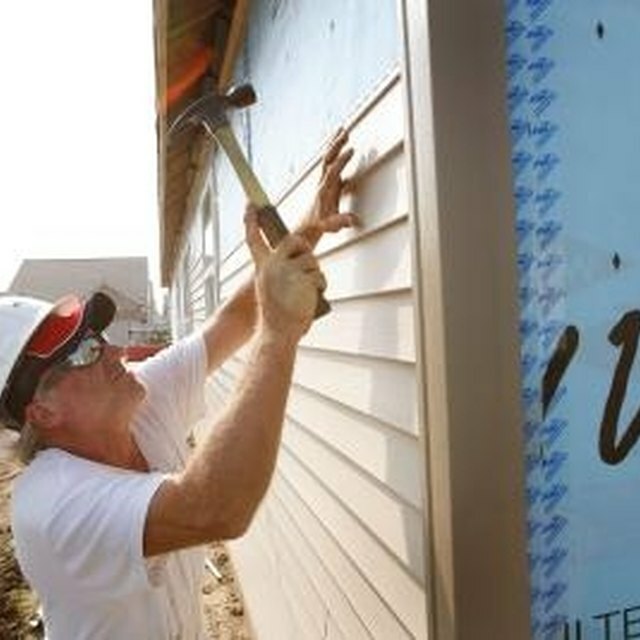 Staple a sheet of siding felt as low as possible on the home. Then, one by one, attach the shake shingles, fat end down across the bottom row, using the siding nails to secure the shingle to the house. Make sure to drive the nails into the top half of the shingles. Attach felt to the next level of wall, being sure to overlap the previously installed shakes by about 1/3 of the height of the shakes. Start the next row by covering about half of the row below with the overlapping shingle and fasten them to the wall in the same manner. Repeat Step 2 until you get to the top of the wall. At the top, either utilize a 1-inch by 8-inch board to crest the newly installed siding, or else cut the thin edge of the siding off at a point that the siding shingle has been lopped horizontally in half. Add the final row and top it off with a ¼-inch board. To keep rows straight, use a chalk line for each level. Install board and batten style siding by stapling felt over the entire surface of the wall. Starting from the center and working out, attach 1-inch by 8-inch boards 1/8 of an inch apart to allow for expansion, all the way out to each corner of the house. Follow this process up by sealing the 1/8 inch seams with 1-inch by 3-inch or else 1-inch by 4-inch batten boards. Be generous when nailing the wide boards with galvanized siding nails, and use finish nails to install the batten over all seams going down to the sides of the house. Finish the edges with a single 1/6-inch batten board running to the corners. Do this to all of the sides of the house to create a board and batten look. Install classic horizontal beveled board by installing all of the felt first. Starting at the bottom, attach the siding, being sure to put the galvanized nails through the top edge of the boards. Add another board, resting it into place at the point of the bevel. Continue this exercise until the entire wall is done. For walls that are longer than the length of the beveled board, remember to stagger the vertical lines, much like a bricklayer does with brick. Lay siding seams as closely together as possible, to eliminate the appearance of vertical seams wherever possible. Sometimes a fresh coat of paint simply will not do in the process of renovating the exterior of your home. Siding is the only sure solution to keeping your home weatherproof and beautiful.